Apply one to two pumps to clean skin. Good Genes can be applied under foundation as a radiance primer, without any oiliness. You can also leave it on for 1-10 minutes for an immediately radiant, deep detox facial. I've been using Good Genes on and off for 3 years and I've come to terms with the fact I miss it desperatly when I don't have it. Thank goodness for Beautylish's Gift Card Event so I can give Beautylish the business I would give to other retailers during a sale otherwise. I've noticed the biggest difference in my skin using prescription Retin-A, an exfoliating toner, Vitamin C and Good Genes. I've had a major reduction in enlarged pores and redness. Exfoliating tonor - Biologique Recherche 1970 P50 - Top of my list of Cannot Live Without. Evening application. Retin-A (prescription) - The transition (skin shedding etc.) stinks, but its worth it. Evening application. I can find dupes for the rest of my routine, but the four mentioned are my holy grails. Thanks Beautylish, your customer service is the absolute best. I will give you my business above all others. 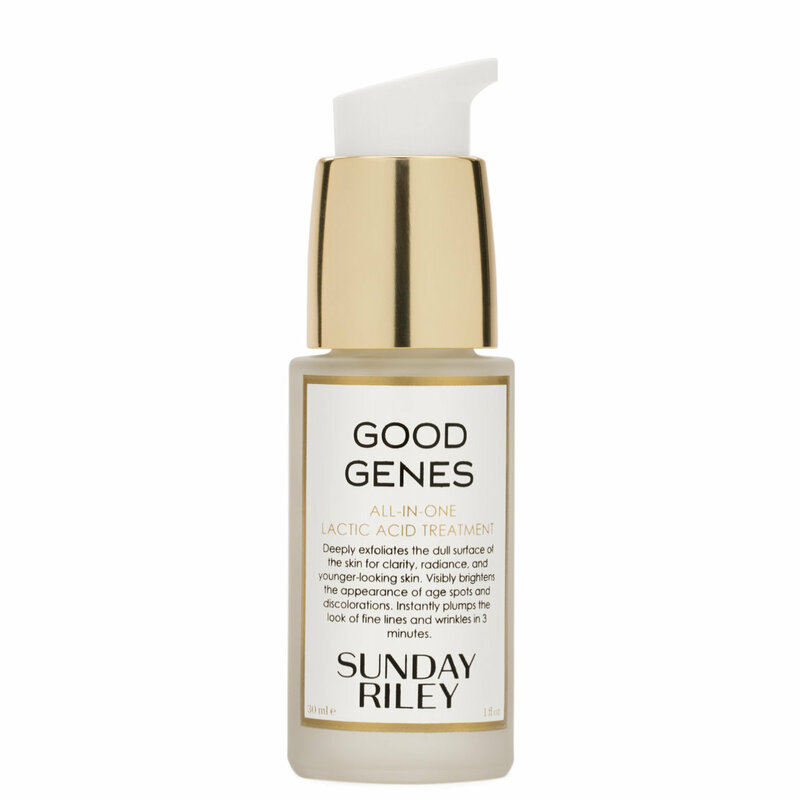 I love Sunday Riley products, and Good Genes has pretty much erased acne as an issue for me. The 50mL size lasts me around 5 months, so it's expensive initially but lasts forever (I use one pump and that's plenty for my face and neck). But if I ran out before I was able to return to America (I live overseas), I always had to use Sephora's international shipping services and they are awful. Prices are in local currency despite paying in USD AND were increased 20%, shipping was always an additional $50+ even if I was just buying one product, and the last time I ordered from them the products were literally just tossed into a cardboard box (no packing materials, no wrapping the items in plastic, nada) and my Luna Oil had broken and leaked all over. Beautylish to the rescue. Not only am I able to get a product I love, but shipping was free and fast. It arrived beautifully packaged; The Good Genes box was in a bag, securely packed with foam, and included a cute note and samples. I absolutely love this product. It has changed my skin in every way. My dark spots are lighter, my cystic acne is pretty much gone and no new breakouts have been able to flourish. Will keep repurchasing. I don’t like the scent but I’m willing to overlook as long as it keeps working. I've been using the all in one treatment along side the UFO dry oil. A quick backstory, I'm about to turn 28 in a couple of weeks and the past two months my skin has been topsy turvy, horrible painful breakouts and weird textures have been plaguing my face and everything I tried wasn't working so I decided to go out on a limb and try something hard hitting. Enter the two I mentioned above, it's already been about a week of using the two and I'm already seeing and feeling a noticeable difference. I've still got pretty bad dark spots from having the blemishes for the course of several months but fingers crossed they'll be gone soon! I’m a believer. Great for oily skin. Great for hyper pigmentation. One star off only for the price...but hey, sometimes you DO get what you pay for. I have been using Good Genes for around two years now, and it is my favourite lactic acid product. I love lactic acid as a chemical exfoliator, it is quite gentle on the skin (more gentle than glycolic which I also use). I use this product every second night, one pump is more than enough to do your face, neck and decollate - if you only wanted to do your face I would just use half a pump. Good Genes noticeably refines and brightens my skin, I put this on as a night time treatment on cleansed skin, and follow with an oil. My skin is always super clear and even the next morning. Personally I hate the smell, but it dissipates fairly quickly and I would far rather have a not so pleasant smell than have a heap of unnecessary fragrances added. I have dry sensitive skin with pigmentation. I was skeptical about this product at first because of the high price point BUT you really do get what you pay for! After only a few days of using this, I already started to notice acne scars and other signs of discoloration were fading! Two months later and my skin's texture is much smoother and firmer (and although the winter air can take a toll on your skin, this product helps me to look glowy!) What I love most about this product is that it does what it's supposed to without drying out my skin (an issue I had with many serums in the past). This is a great product. I've noticed such a difference in my skin. Paired with the Luna oil, I'm hooked on Sunday Riley! This product is awesome! It has cleared my skin up. I had adult acne and this and the U.F.O. oil worked wonders. Not my first time using this product but it is my first time ordering from beautylish. I will never shop anywhere else again. Beautifully wrapped and great attention to detail. Really special!!! I’ve only been using Good Genes for 2 nights now and I just had to share my results! I have combo normal skin and had terrible acne as a teenager that resulted in taking accutane and I’ve had this scar in my cheek that looks like a baby crater and it is almost gone! I’ve tried resurfacing peels, micro needling and nothing has helped it until Good Genes. My skin is so soft, the angry 11s between my eyes are less noticeable and that darn scar is actually almost gone. Thank you beautylish for offering the flex payments or I never would have even thought about purchasing it.